I was recently hired to help a client update her kitchen for resale. The goals were to a) do it quickly and b) on a tight budget. Any of you who follow my blog know that those words are music to my ears. My credo is working on a budget forces you to turn lemons into lemonade with the sweet elixir of creativity. So my response to the challenge was, "bring it"! In comes the knight in shining armor...Chalk Paint! Why? 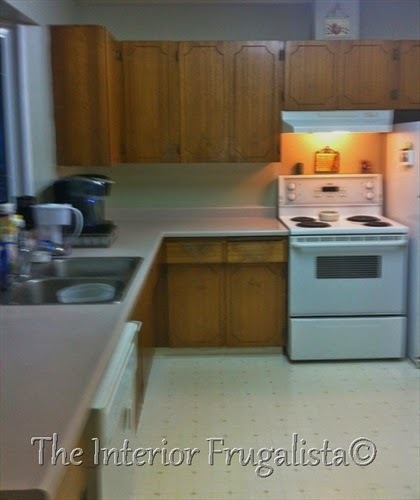 Because you don't have to remove the cabinet doors, no priming, fast drying time between coats, the paint goes a long way, you can finish an entire kitchen in a few days, and the best part...it'll cost you less than $500.00. In fact this one was done for less than $300.00. How's that for a quick and inexpensive kitchen update! Take a look at the Before pictures (sorry the photos are a bit blurry they were given to me by my client). Her kitchen has so much light thanks to the beautiful bay window and French door leading onto the deck. When you walked into the room instead of being drawn to the sun filled warmth of this space and the pretty green paint on the walls, your eyes were immediately drawn to those dark, dated, mahogany relics from the past. Normally with chalk paint all I recommend for prep is filling in the nicks and gouges with my favorite filler, Dynamic Dyna Patch Pro (I'm not affiliated in any way with the product - just sharing the love) and sanding it when it's dry. But in this case being that we were dealing with mahogany which has a tendency for bleed through, I recommended applying a coat of Zinsser Bulls Eye 1.2.3 Primer (my favorite primer - just shar'n the love again). Once primed you can see any imperfections you may have missed and can fix them before going ahead with the paint. We used Country Chic Chalk Paint in Vanilla Frosting. It's a beautiful warm antique white color. 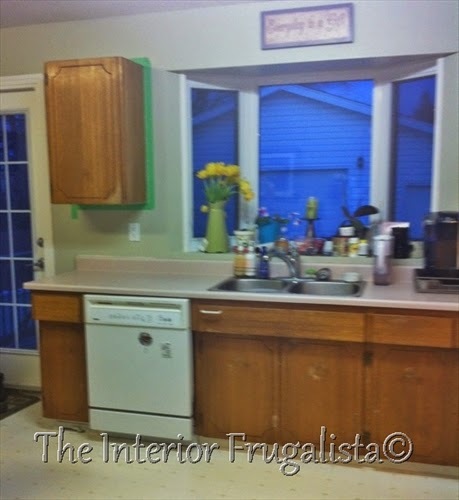 Pssssst, would you believe only two quarts were used to paint this entire kitchen! By the time the first coat was applied the cabinets were dry enough to give them a light sanding with 400 grit fine sandpaper, wipe the dust and start the second coat. A quick third coat was applied to cover a few spots that we weren't happy with. All the cabinets received three coats of Country Chic Paint's Tough Coat protective finish. Normally I use soft clear wax on my chalk painted projects but for kitchen cabinets, they get a lot of beating use and so it's a good idea to protect them with a satin poly finish. With the Tough Coat product (which I prefer over poly) you can get away with only two coats but after my client applied them there was a lot of streaking. After some head scratching I determined that the streaking was caused from the product not being stirred well enough beforehand. Note: It's a good idea to stir it again every so often while applying it. Once I gave it a real thorough stir and reapplied another coat it looked MUCH better. Normally I recommend replacing old hardware to give the cabinets a fresh updated look but in this case I thought the original solid copper hardware would add unique charm and character to the cabinets. So I suggested cleaning them well and re-installing them. 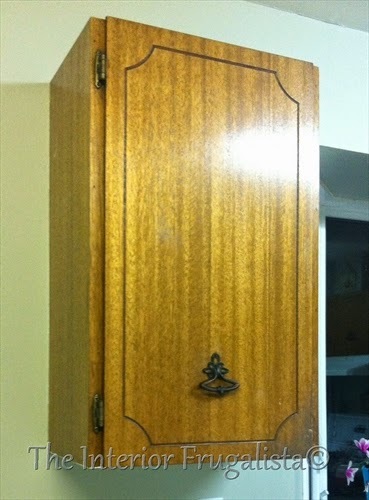 Here is what they looked like on the cabinets before the makeover. But when I held one up to the freshly painted cabinets I wasn't liking the contrast at all. So I took them home with me and gave them some chalk painted goodness! After they were dry I distressed them a little with sandpaper to reveal some of the copper underneath. Then I gave them a couple coats of soft clear wax and buffed them until they had a gorgeous satin patina. I should step back a little here and tell you that the insides of the cabinets received a fresh coat of white Behr Premium Plus Ultra Satin Enamel Paint and Primer in One before the makeover. Here comes the best part...drum roll please...the chalk paint and tough coat came to a grand total of under $200.00. 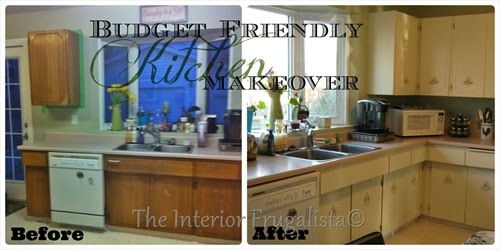 After factoring in the primer, interior cabinet paint, brushes, and supplies this kitchen update came to under $300.00! Doing the office chair jig as I type this.